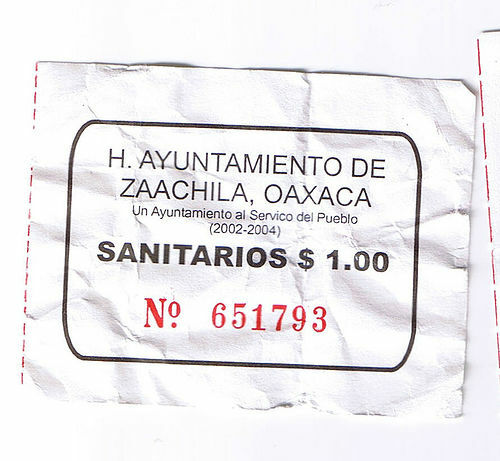 Had I been in Mexico, the nice bathroom attendant would have directed me to the right place, after handing me two squares of toilet tissue and my 1 peso (10 cents) ticket. I don’t know why they give you a ticket. They stand right there and watch you go in, and no one ever takes the ticket. After a long and pleasant meal at a restaurant with the dear Glennia, I got up to go to the bathroom. As I was sitting in the stall, another person walked in, and instead of using the only other stall, stood at the mirror. I glanced through the crack in the stall. Oh no, I thought. I’m in the men’s restroom. Again. This had happened before, at a concert. The band announced a break and I dashed into the restroom before the crowd could show up. I was in a stall. When I came out, I was facing the backs of about 8 men using a trough urinal – something I hadn’t seen when I ran in because I was so determined to beat the other people. Oops. Hi, guys! Nice to see you! So here I was again, wondering what to do. Why, WHY didn’t I check the sign on the way in to see if it truly was the ladies’ room? The man stood at the mirror FOREVER. I don’t think I saw a urinal on the way in. Why didn’t he go to the other stall? I wondered and waited, annoyed that he wouldn’t leave. I couldn’t walk out and run right into him. Then he’d know I was a woman in the men’s restroom. I could not face him. The reason he didn’t use the other stall was that the door was broken off and leaned up against the toilet. He was waiting for me because he had no where else to go. No urinal in sight. As I walked out the door, I checked the sign. I was indeed in the ladies room. HE was in the wrong place. Hmph. What the heck was HIS problem? Then as I sat down, I saw “him” sitting at the next table. “He” was just a woman with very short hair, jeans and a plaid cowboy shirt. So I sat there on the toilet and prevented another woman from using the restroom for about 10 minutes. She probably left because she assumed I was massively constipated and she feared the eventual outcome. And you know what? I’ll bet she was too afraid to ever go back in. She probably went to the Starbucks down the street. You’re lucky. Woman in the men’s room = mistake. Man in the ladies room = felony, even if you’re innocent, 9 sheets to the wind, and incapable of anything more threatening than slurring your words. For the longest time, I thought the new people who moved in across the alley from me were either a husband and wife or husband and husband. Then one day I was out washing my car and the one I was sure was a husband came over to chat and I realized they’re a wife and wife. Super nice people but terrible haircuts. I have that haircut right now, too. It’s kind of a Robby Benson mullet.